The users of the system can browse for information, generate reports, update through the user interface. 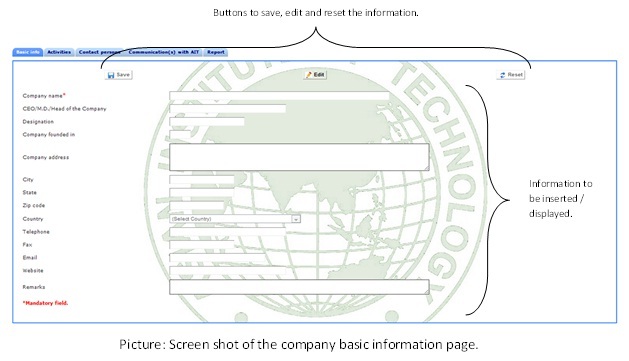 This section of the document describes each and every page of the user interface. A screen shot of the navigation of each of the sections are explained using pictures. This is the first page of the system. This page briefly talks about the fundraising campaign, the objectives of the campaign and the role of the vehicle Friends of AIT (FoAIT) Foundation. A screen shot of the page is shown on the left hand side. As soon as the URL of the website is typed in the browser's address bar, the index page will appear. This page contains, few Paragraphs introducing users with the system, about the campaign, the vehicle Friends of AIT (FoAIT) Foundation, etc. Each user will be given a unique and specific user name and password. The user will use their specific user name and password to sign in to the system. Normally email is used as the user name. The reason using email as the username is it will be used to retrieve and/or change the password. A screen shot of the login page is shown on the right. There are messages also on each of the pages for the user. If the user enters a worng username and /or password, the user will be notified with specific messages in red color. Users are divided into following 5 categories. Following are a brief description on each of the categories. - Administrator: The Administrator will have full control of the system. This group has the permission to add, edit, delete and generate report from the system. The administrator group members have access to an admin module which will support different functionalities of the system. - Management: Users in this group will be the management team such as the Vice President for Resource Development and Director Fundraising. The users of this group will be able to see a summary report on different projects. They can alsoo view detaul information of different constituents of the campaign, such as alumni, current and former faculty, current and former staff, foundations, philanthropists etc. Detail information will be summarized and displayed in different forms of charts, such as pie charts, column charts, bar charts, geo charts, etc. The users of this group, through a navigation board will be able to see the details information as well and they also will be able to generate customized reports according to their requirements. - Data manager: The users of this group are the most important group of the system. This group of users will be responsible for adding, editing the information and generating reports in to and from the system. Through a navigation panel the users in this group will have access to the list of all different constituents, depending on the role assigned by the administrator. This is to mention that not all the group members may have access to all the modules. - Donor: Donors will be able to see their own details after logging into the system. The users of this group have access to see the summary of the details generated from the system. Pie charts, tables, column and bar charts, geo charts, etc. are used to display the information. - General user: The general users, with a general user name and password, will have a limited access to view the summary of the system. Different types of charts are used to display the summary. This page helps to retrieve the password of a user. A screen shot of the page is shown beside. Once the user enters into this page, the user requires entering their username, which is their email account. Once the username is entered, the changed password, generated randomly will be sent to the user's email address. If the user is not a registered user, there will be meesage displayed and only registered users can retrieve their own password. Once the user enters into the system a summary of the contributions towards the campaign is displayed. The page will have 3 types of different dashboards to navigate depending on the user role. Right side is the pictorial view of the links to the 3 types of dashboards. Following table shows which type of user is authenticated to view which type of dashboard. According to the following table, the top management and administrator group is authorized to vies all types of dashboards. The data managers are authorized to view the dashboard and visual. Whereas, the donors and general users are authorized to view the basic dashboard only. This page displays the list of the projects with a brief description and a link to their summary report. This is a dynamic page generated from the database. Picture on the right hand side shows the screen shot of the dashboard. Once the user clicks the “See more …” link, a new window opens with the summary of each of the projets. Different types of graphs are used to display the detail fundraising by constituents, income, usage, investment, etc for each project. If the user clicks the name of the project, a list of donor along with basic information will appear. 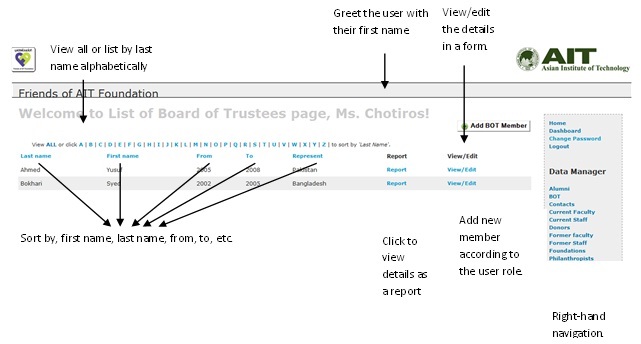 The user can view/edit the donors details by cliking the name of the donor. This page visually displays the summary of the information from the system. Different constituent's information is shown in tables, geo charts and in pie chart formats. Users can choose different constituents from a drop down list and the type of graph to display the results. The user can hover the mouse on top of a country on the map and see the exact value for that location. If there is no value, then no charts will be displayed. The user can hover the mouse on top of any of the field to get additional information. This page is only accessible by the top management and administrator group. This page is used by the user to navigate through the system. A screen shot of the page is shown on the right hand side. Through the navigation board, the user can drill down to the details of the constituents for further information. Once the user clicks any of the links, a list will be displayed and from the list user can choose or search to further go in to the details. Following sections will discuss more about each of the pages the user may come across while browsing. Some additional features such as sending emails to an individual or a group, list of people who have missed their payment, which prospect is approached by which unit, who are our alumni hall of famers, who has birthday or anniversary today, etc. are embedded in to the system. The right hand side navigation panel is different depending on the role of the user. Table on the left hand side describes visually the different right-hand side navigations according to the user role. The user depending on their role will be able to view a list once either of the constituents label is clicked. 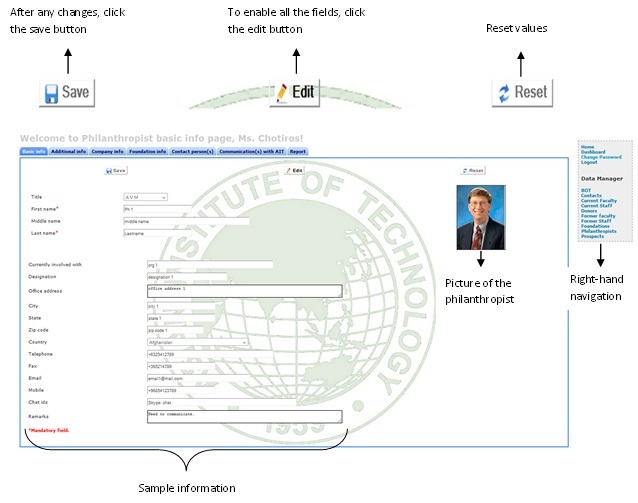 The donor will be able to see their details once they click the "Detail information" label. The top management will browse through the navigation panel to view detail information. Data Managers have the right to go into each details depending on their role as authorized to update information. The general users have common user name and password to login to the system with limited access. Similar to the picture on the right hand side, at the bottom of every page there is a link available for the help file. Once the user clicks the "Help" link a new window with the detail user guideline will appear. The document is divided into different sections for easy access. The user can then click any of the headings to view the details on that specific topic. Following are the screen shots for each of the pages for each of the constituents. Basically the first page is the list of members belonging to that particular group. The user can select the alphabets to sort the list according to a specific field. Then the user can also sort ascending or descending according to the labels mentioned below the alphabets. The user can view details, edit/view (depending on their role), delete and transfer all the records to prospect, donors, etc. Following, we have different types of screen shots for a better understanding. 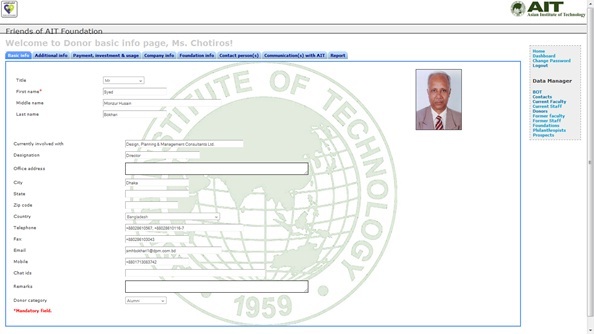 This module of the system stores information of AIT’s alumni starting from the first graduation in 1961. Initially we collected the basic information of each member from our alumni office and add the required information for our fundraising office. Following are the screen shots of each of the pages in this module. List of Alumni: This is the first page under the Alumni module, which shows a list of the members. The list is displayed sorted by the last name of the member. There are 200 rows displayed in one page. Left hand side is the screen shot with very basic information. View/edit screens: Once the user clicks the view/edit label, the user is redirected to the page where forms are used to enter and /or update the information of a particular member. Following is the screen shot of the top navigation menu for the Alumni member module. Basic information page: The page contains all the basic information of the member. At the top of the page there are 3 buttons, namely Save, Edit and Reset, as shown in the following picture. All the other tabs have the same 3 buttons with same functionality. The mandatory fields are also marked for easy understanding. There is an option also to upload and edit the picture of the member. Some instruction is given while using the system. 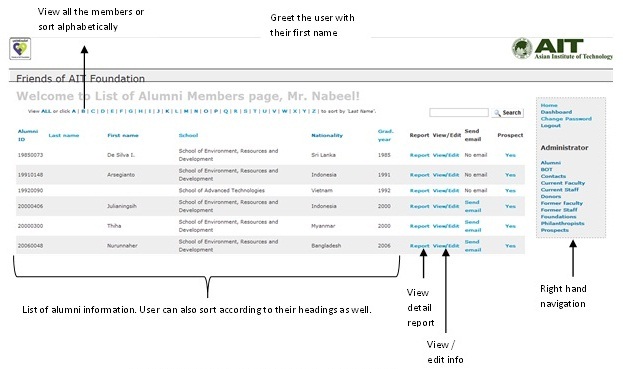 Additional information page: This is the second tab of the Alumni module. This page stores additional information on the member. Same as the previous page, this also has 3 buttons to save, update and reset information. 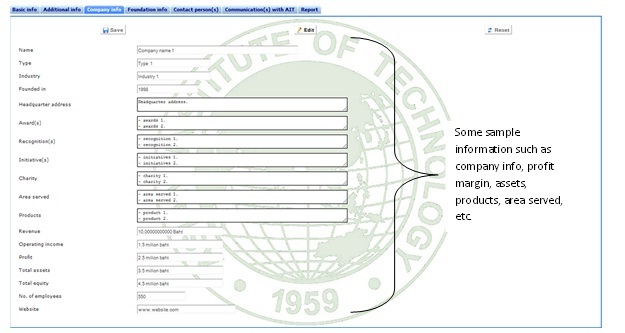 Communication with AIT: This page briefly stores communication details between AIT and the Alumni member according to the date met. The user can also add and delete rows to insert several meetings information. Report: This page displays the list of fields available for the member. According to the requirement user can select the required fields and generate report. Full report at a glance: Once the user clicks the “Report” label while viewing the list of members, following page will appear with all the detail information. This will be useful especially for the top management to view the detail report at one glance. 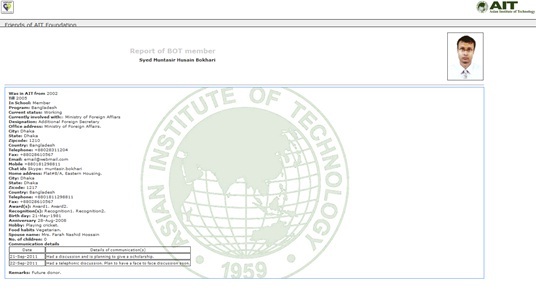 This module of the system stores information of AIT's current and former Board of Trustees and New Council members' information. Initially we try to gather and store the basic information of each member. Following are the screen shots of each of the pages in this module. List of BOT: This is the first page under the BOT module, which shows a list of the members. Beside is a screen shot with some mock information. All the pages, welcomes the user with thier first name. Through this page the can either view all the records or sort by last name using the letters. The users can also sort the list using the other fields as well. If the Report link is clicked, the user will have a access to the detail report of the particular member. 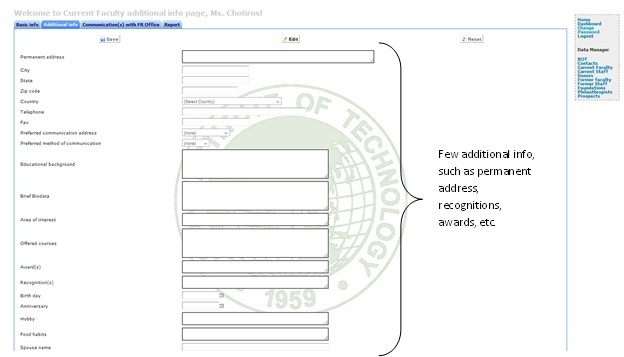 Depending on the user role, the details can also be viewd through forms, which are discussed following. The user if authorized is also eligible to add new record. View/edit screens: Once the user clicks the view/edit label, the user is redirected to the page where forms are used to enter and /or update the information of a particular member. Left side picture is the screen shot of the top navigation menu for the BOT member module. For the convenience of the user the total information is divided into several tabs. Through these tabs the user can navigate to the basic, additional information, communication with AIT and finally to a page where the user can select the required fields from the list and generate customize reports. Basic information page: The page contains all the basic information of the member, such as first name, middle name, last name, name of the country or organization representing, eamail, current office addres, etc. At the top of the page there are 3 buttons, namely Save, Edit and Reset, as shown in the picture on the right hand side. The user requires to click the edit button to enable all the fields. Once there are changes, the user needs to click the save button to save and/or update the information. All the other tabs have the same 3 buttons with same functionality. The mandatory fields are also marked with a red start (*) mark for easy understanding. The user can also upload a picture of the member, by clicking the picture area. If there is no picture then a gray area will be displayed with the text "No picture". The file size of the picture should be less than or equal to 64 Kb. If the picture size is more than 64 Kb, portion of the picture will be displayed. User can delete the existing picture, by clicking on the same area and upload a new picture. There is an option also to upload and edit the picture of the member. Some instruction is given while using the system. Additional information page: This is the second tab of the BOT module. This page stores additional information on the member, such as awards, reognition received, home address, birthday, anniversary, hobby, food habits, etc.. Same as the other pages, this also has 3 buttons to save, update and reset information. The user, depending on the user role, needs to click the edit button to enable all the fields. Once there is any changes, the save button needs to be clicked to save the changes. There are additional messages provided to the user through pop-up windows as well. 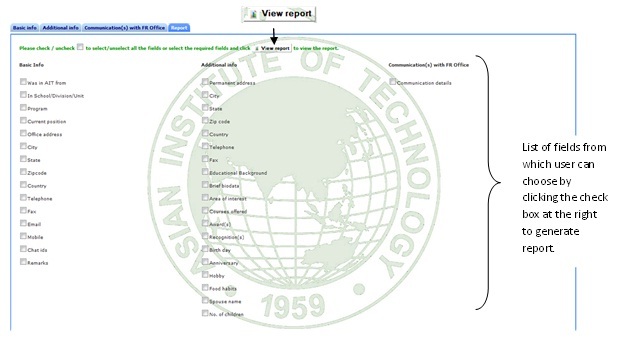 Communication with AIT: This page briefly stores communication details between AIT and the BOT member according to the date met. The main purpose of this window is to store in brief each and every communication between the member and AIT. This will especially help the top management to view the previous discussion(s) before meeting the same member. The user can do all this by adding rows to insert several meetings information. 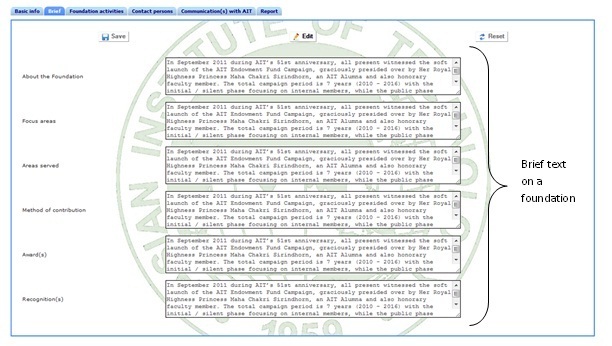 A screen shot of the comunication with AIT is shown on the right side. Report: This page displays the list of fields available for the member. This page is mainly to generate customized reports. 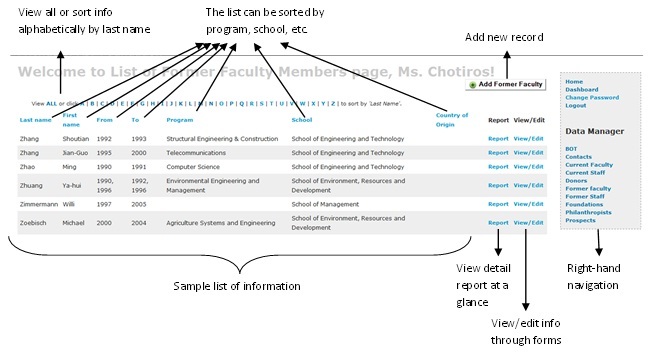 The user can select from the list of fields available for the member. The user can choose each field by clicking the box next to the field. Sometimes we may need to view specific information of a member and this page is the right area to look for specific information of a member. The user is allowed to take a print out of the customized report. Full report at a glance: Once the user clicks the “Report” label while viewing the list of members, following page will appear with all the detail information. This will be useful especially for the top management to view the detail report of a member at once glance. This module of the system stores information of the people whom the top management meets during their mission at native and abroad. These contacts may become a prospect in the future and the details stored will be useful even for future references. List of Contacts: This shows the list of contacts. The user is welcomed to every page with their first name. According to the requirement and authentication, the user can sort the names alphabetically by last name or view all the records in one page. The user can also sort by first name, company, job title, meeting place, etc. User can view the full report at a glance by cliking the Report link. The user, depending on the authorization is also can view and / or edit information of a particular user. On the right side is a pictorial presentation of the page with some mock information. Through this the user can add a contact group, which may be named after a particular trip or a particular group. The authenticated user can also add a new contact. View/edit screens: Once the user clicks the view/edit label, the user is redirected to the page where forms are used to enter and /or update the information of a particular member. 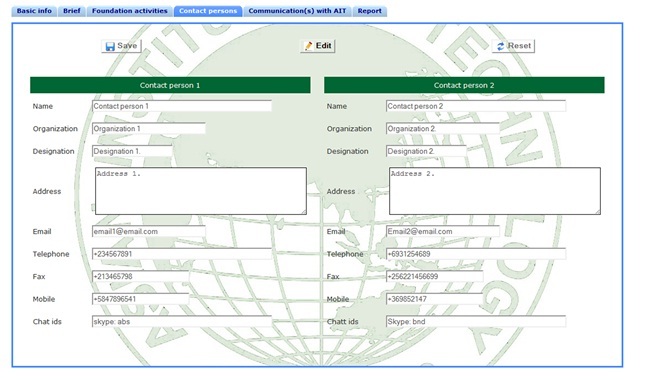 The dtails of the contacts are stored using three tans, such as contact details, communications with AIT and the report. Left side picture shows the screen shot of the top navigation menu for the contact module. Contact details page: The page contains all the basic information of the contact, such as first name, middle name, last name, name of the company. designation, office address, with whom they met, the date of meeting, any remarks, etc. At the top of the page there are 3 buttons, namely Save, Edit and Reset, as shown in the picture on the right hand side. All the other tabs have the same 3 buttons with same functionality. The mandatory fields are also marked with a red star (*) for easy understanding. Certain instruction is also provided on the page itself. 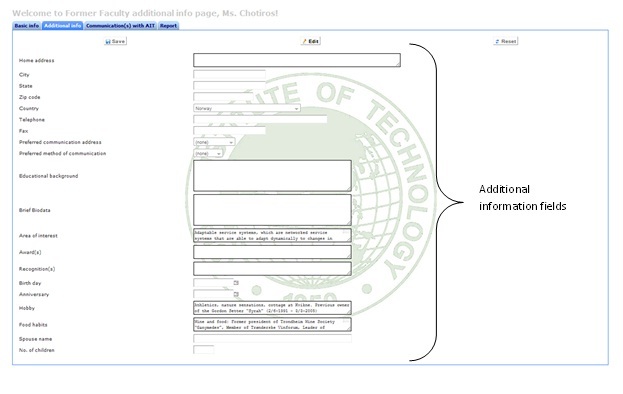 Communication with AIT page: This page briefly stores communication details between AIT and the contact according to the date met. The user can add and delete rows to insert several meetings information. This is very helpful for the top management as they can login in to the system and check the details of their previous meetings with the same person. Report: This page displays the list of fields available for the member. According to the requirement user can select the required fields and generate customized reports. Sometimes, the user needs to see particular information of a member and this is the right place to generate a customized report based on the requirement. 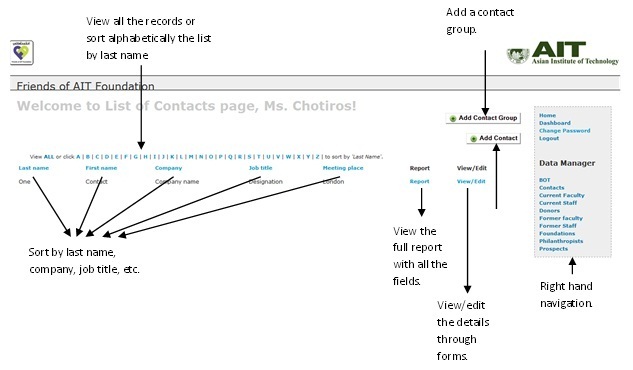 Full report at a glance: Once the user clicks the "Report" label while viewing the list of contacts, the picture displayed on the right hand side will appear with all the detail information of a single contact. This will be useful especially for the top management to view the detail report at one glance. 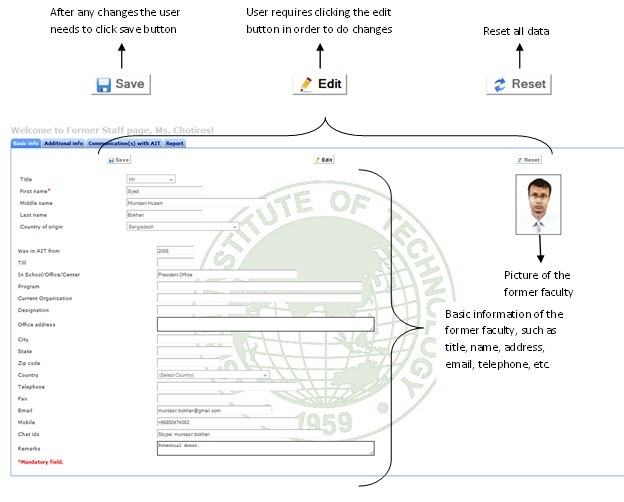 This module stores information of the current faculty members, such as their full names, contact details, awards, recognitions, hobbies, food habits, etc. following are the details of each of the screen/forms within this module. List of Current faculty: Right hand side is thepictorial representation of this page with some mock information. Depending on the requirement the user can either view all the records within this module or sort alphabetically by last name. Some instructions are also provided on the page. The user can also sort by first name, school, position, etc. Through this page the authorized user can add a new records as well. 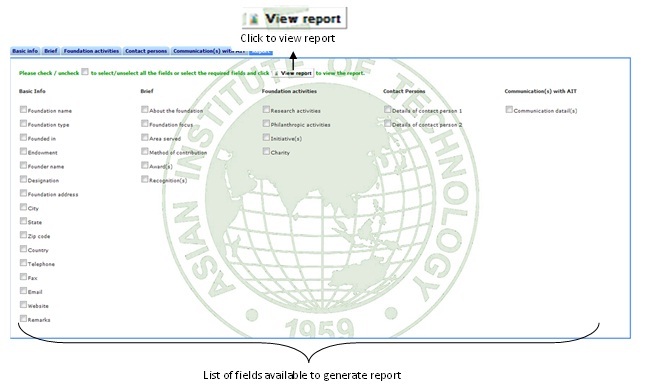 The user can also view the detail report at a glance by clicking the associated Report link. Through this the usee can also drill down to the details of the member, depending on their user role. View/edit screens: Once the user clicks the view/edit label, the user is redirected to the page where forms are used to enter and /or update the information of a particular member. Left side is the screen shot of the top navigation menu for the contact module. The total information of a member is stored and displayed using tabs, such as basic information, additional information, communication with FR office and report. Following are the details on each of the forms. 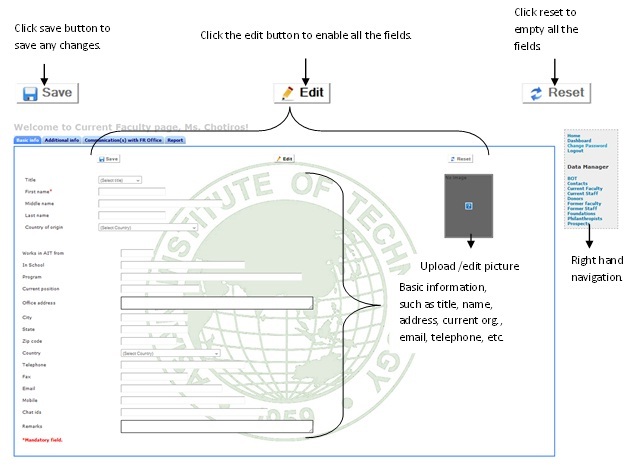 Basic information page: The page contains all the basic information of the current faculty member, such as full names, designaption, detail address, emails, chat ids, etc. At the top of the page there are 3 buttons, namely Save, Edit and Reset, as shown in the picture on the right hand side. All the other tabs have the same 3 buttons with same functionality. The authorized user can also upload pictures of the member. Once the picture area marked in gray is clicked, a pop-up window will appear. The user needs to choose the picture and click the upload button to upload the picture. The picture needs to be less that 64Kb, otherwise some portion of the picture will be uploaded and displayed. On the pop-up there is also an option to delete the picture. The mandatory fields are also marked with a red star (*) for easy understanding. Specific instruction is provided on the page as well. 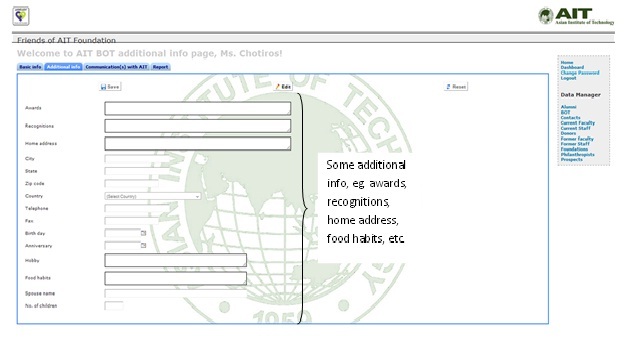 Additional information page: This page stores additional information on the current faculty, such as permanent address, brief biodata, awards, recognition, areas of interest, hobby, food habits, etc. Same as the previous page, this also has 3 buttons to save, update and reset the information on this page. The idea is always to store as much as information possible on a member, so that while discussing with the member, it helps to know the person even better. 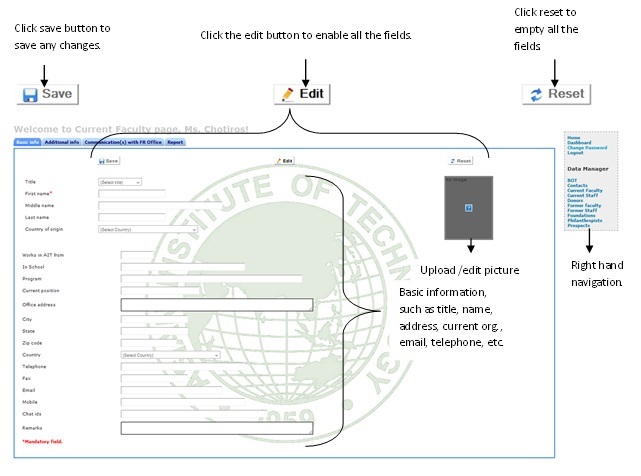 Communication with FR office: This page briefly stores communication details between fundraising office and the current faculty according to the date met. The user can add and delete rows to insert several meetings information. This is especially important and useful for the top management to see the history of past meetings. 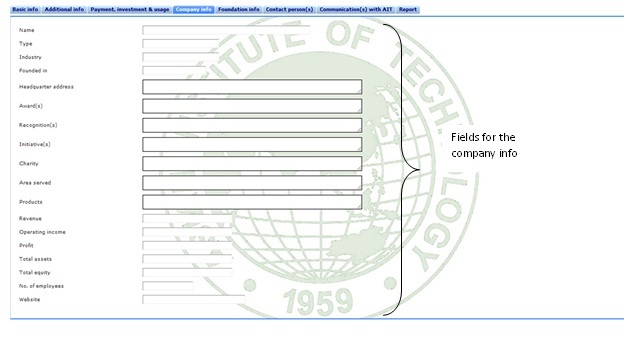 Report: This page displays the list of fields available. According to the requirement, user can select the required fields and generate report. Sometimes, users need to view particular information and this page provides that option to the user. 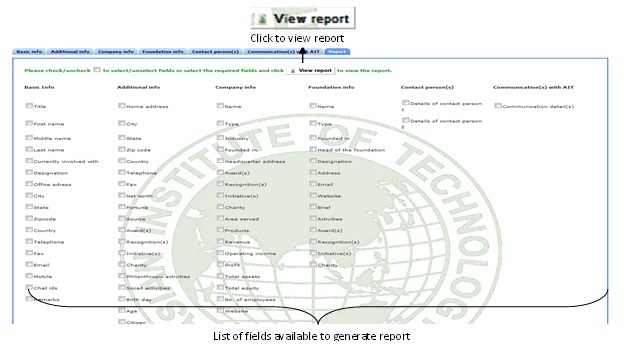 Once the user chooses the required field, then he/she needs to click the view report button to generate the customized report according to the requirement. Detail report at a glance: Once the user clicks the "Report" label while viewing the list of members of the group, page shown on the right side will appear with all the detail information of a single member. This will be useful especially for the top management to view the detail report at one glance. This module stores information of the current staff members. Current staff members are also one our prospects during the initial/silent phase of the campaign. Through this module we will store the basic information of the current staff members. List of Current staff: Picture shown on right hand side, shows the lsit of current staff page. Through this page the authorized user can add a new record. Depending on the requirement, the user can either view the total list or sort alphabetically by last name. The user can also sort the list by first name, school, position, etc. If there is no information in the module, a message will be dislayed saying that there is no information. The user can view the detail report at one click once the Report link is clicked. The user depending on their user role can view and / or edit the information of a specific member. View/edit screens: Once the user clicks the view/edit label, the user is redirected to the page where forms are used to enter and /or update the information of a particular member. Picture on the lft hand side is the screen shot of the top navigation menu for the contact module. The total information is divided into several tabs, such as basic information, additional information, communication with FR office and report. Basic information page: The page contains all the basic information of the member, such as first name, last name, designation, detail address, email, etc. The authorized user can also upload a picture of the member. The user needs to click on the gray panel, a pop-up window will come up. Using this pop-up the user can upload and delete pictures. At the top of the page there are 3 buttons, namely Save, Edit and Reset, as shown in the following picture. All the other tabs have the same 3 buttons with same functionality. The mandatory fields are also marked with a red star (*) for easy understanding. Selected instruction is provided on the page as well. Additional information page: This page stores additional information on the current staff, such as home address, emails, awards, recognitions received, hobby, food habits, birthday, anniversary, etc. Same as the previous page, this page also has 3 buttons to save, update and reset the information. Communication with FR office: This page briefly stores communication details between AIT and the current staff according to the date met. The user can add and delete rows to insert several meeting information. This is very helpful especially for the top management to view the details of their revious meetings with the same person. Report: This page displays the list of fields available. According to the requirement, user can select the required fields and generate customized reports. 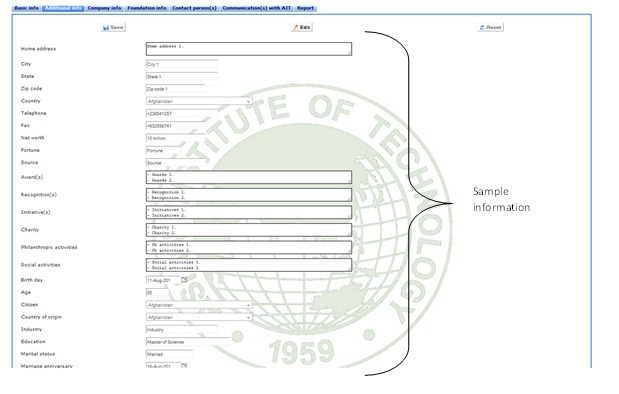 Sometimes information on particular fields are required by the user. Through this page the user gets the flexibility to generate reports according to their needs. Detail report at a glance: Once the user clicks the "Report" link while viewing the list of members of the group, following page will appear with all the detail information of a single member. This will be useful especially for the top management to view the detail report at once glance on a specific staff member. This is the largest and one of the most important modules of the system. This module stores all the detail information of the donor, such as basic information, some additional information, company and foundation information if there is any, contact details, etc. Following is the detail of each of the pages within this donor module. This module is accessible to the administrator group only to edit. The other groups are only eligible to view the information available in this module and if required print a customized report according to the requirement. 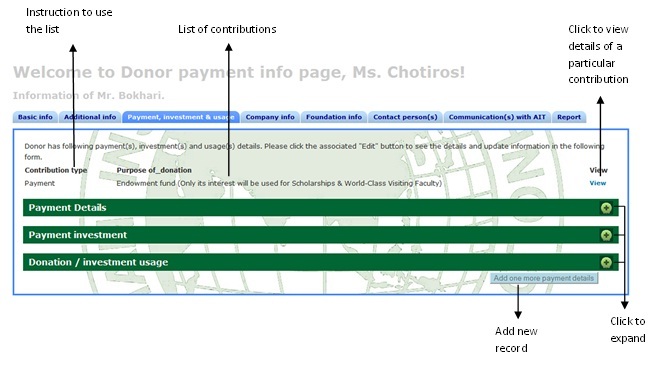 List of Donors: Right hand side is a pictorial representation of the page with the current donor information. Depending on the requirement the user can either view the detail list of donors or sort alphabeticall by last name. The user can also sort by country, regoin, etc. 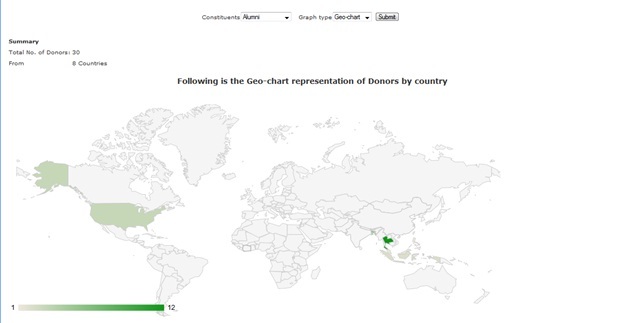 The user can click the associated Report link to see the detail report of a particular donor. 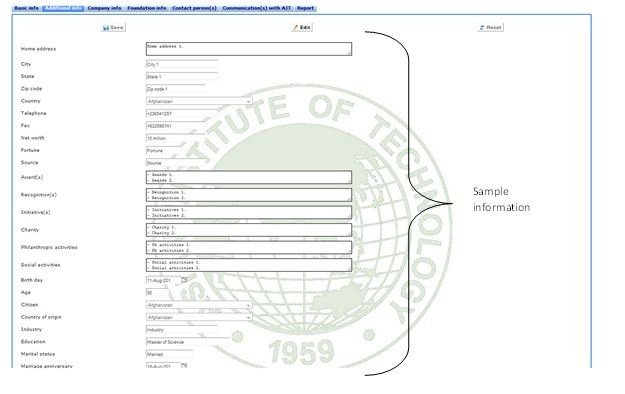 The user can also view the details through a form. The administrator group is only authrozied to change any information. The top management and only the particular donor is eligible to view their own information. Through this the user can view and edit records, depending on their authentication. The authenticated user can only add and delete a record. View/edit screens: Once the user clicks the view/edit label, the user is redirected to the page where forms are used to enter and /or update the information of a particular member. 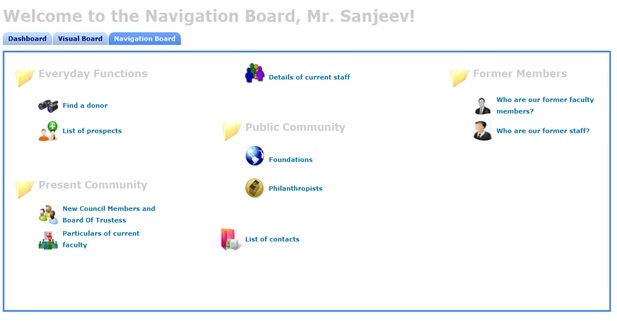 Left side icture is the screen shot of the top navigation menu for the donor module. 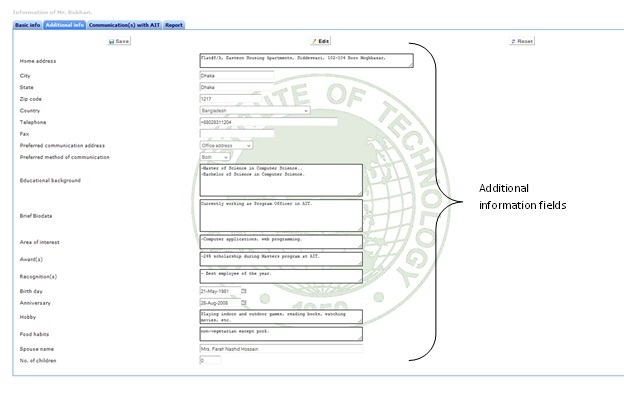 The detail information is divided into several tabs, such as basic information, additional information, payment, investment and usage information, company information, foundation information, contact person information, communications with AIT and report as shown on the left hand side. Detail report at a glance: Once the user clicks the "Report" label in the first page of this module, a new window will open with all the details of the specific donor available in the database. This is very useful for the top management as they can at a glance view the detail of the donor, such as their contact details; additional information such as awards, recognitions, home address, food habits, etc. ; company details (if there is any), foundation details (if there is any); contact persons, through whom we have communicated with the donor; communication with the donor and a customized reporting format according to the user's requirement. Basic information page: This is the basic information of the donor, such as title, name, office address, email, telephone, etc. A picture of the donor is also uploaded for future reference. The user just needs to click on the picture and a pop-up window will appear. Using the pop-up window the user can upload and delete pictures. 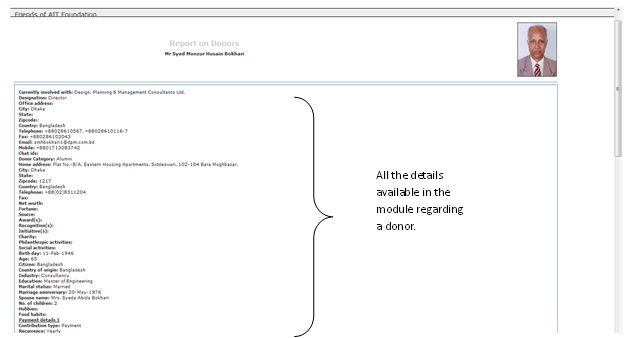 Left side picture is the screen shot of the donor's basic information page. Since this is the most important module of the system, the administrator is only permitted to edit any information. The mandatory fields are marked with red star (*) mark for better understanding. There are additional guidelines also available on the page itself. Additional information page: The additional information page includes some personal information, such as home address, awards, b'day, marriage day, anniversary, food habits, marital status, hobby, nationality, birthday, anniversry, etc. Payment, investment & usage page: This is the most sensitive portion of the module. The system keeps track of the details of the payment, such as the type of payment, total received, if there are any bank charges, conversion rate, purpose of contribution, plan of contribution. Then the contribution either may have to be invested or used according to the instruction of the donor. All these are displayed in one page, but divided into 3 sections for clear and beter understanding according to the picture on the left hand side. Following are the screen shots of the payment, investment and usage section of a particular donor. 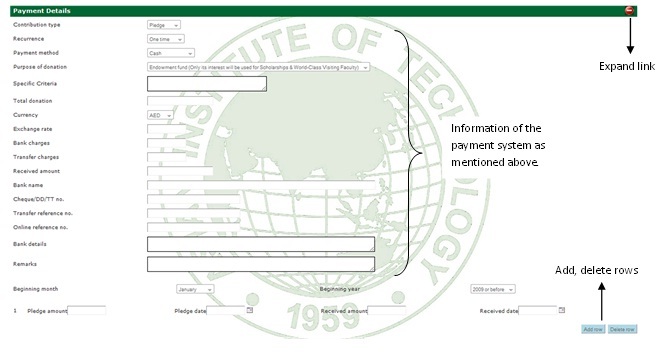 Payment information section: This page keeps record of the detail payment system of the donor, such as donation types, type of payments, the purpose of donation, recent bank details used to contribute, the currency of the contributions, total donations received, associated bank charges, etc. This section also includes the payment plan of the donor, such as the beginning month and year, the amount donor plans to donate on a monthly, yearly or one time basis, the date and amount received, etc. The authenticated user can also add and delete rows of payment, pledge and received accordingly. Following is a screen shot view of this section. Investment information section: This section stores information of the investment details of the contribution from the donor, such as type of investment, start and end date, invested amount, interest amount, etc. Donation/investment usage information section: This section stores information of the usage of the donor's contribution of a particular donor, such as usage amount, type, receivers details, etc. Company information page: These are additional tabs with information on the company owned and / or managed by the donor. These information may be helpful in the future for further association with AIT, such as there can be sponsored projects through which the institute can be benefited. The main reason is to store as much as information possible of a donor. Foundation information page: This tab stores and displays information on donor's foundation if there is one. The focus is to store relevant information and later match with the areas of interest of a particular or a group of faculty, field of study or school along with the requirement of the foundation to say for example apply for a project grant, etc. Contact person information page: Sometimes the donor will be approached through an alumni network or friends of alumni, staff, faculty, even students. Also there is always one person with whom we may need to contact for future meetings, details, etc. This page will store the information of both the contact persons as a future reference. Communication with AIT page: This page stores the communication between the donor and the institute. This information can be used as future reference especially for the top management. Report: This page displays the list of fields available. According to the requirement, user can select the required fields and generate report. Sometimes the user requires particular information and this is the area where the user can select the required fields and generate customized report according to their needs. Former faculty members are one of our ambassadors. 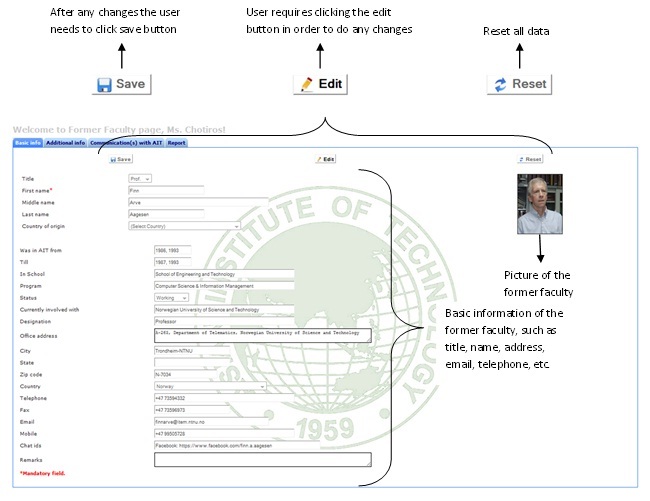 This module stores the updated information of our former faculty members. We also store information on their research activities, awards, recognitions, so that in the future we can match with the current faculty's interest and put them together to bid for a project, for an example. List of Former faculty: Following is the pictorial representation of the list of the former faculty page. The user can choose to view all the information or choose an alphabet to sort by last name to minimize the list. The user can also sort by first name, program, school, etc. The user can also view the full report in one click by clicking the Report link. The user can also view/edit the information depending on their user role. View/edit screens: Once the user clicks the view/edit label, the user is redirected to the page where forms are used to enter and /or update the information of a particular member depending on the role of the user. Such as the administrator will have the full access; top management may only view the detail information; data manager may only edit information, etc. Left side picture is the screen shot of the top navigation menu for this module. 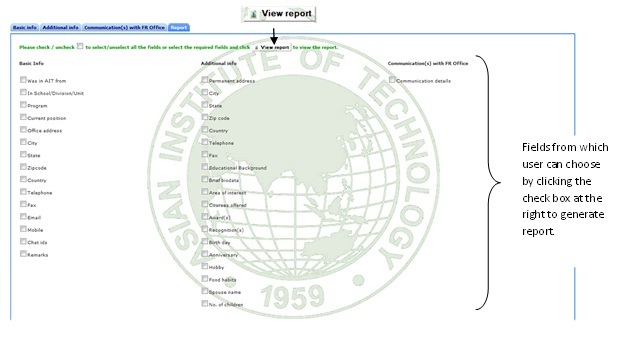 The total information of the user has been divided into several tabs, such as, basic information, additional informationm communication with AIT and the report. These forms are discussed individually in the following section. Basic information page: This is the basic information of the former faculty member, such as title, name, address, email, telephone, etc. A picture of the former faculty is also uploaded for future reference. Once the authorized user clicks the picture area, a pop-up window will come up, which can be used to upload and update the picture area. 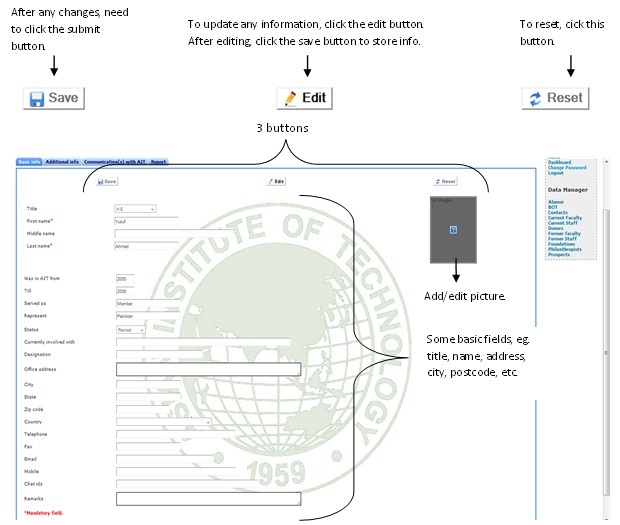 The picture on the right hand side is the screen shot of the former faculty basic information page. Mandatory fields are marked with red (*) start mark. If the mandatory field is not entered a message box is displayed with proper instruction. Depending on the user role, users are authenticated to view/edit the information. This page has 3 buttons at the top, namely Save, Edit and Reset. The edit button needs to be clicked to enable all the other fields. Once there is any changes, the save button is required to be clicked to save the changes. The reset button will reset all the fields to empty. Additional information page: We are storing some additional information of our former faculty members, such as their research interests, awards won, recognition, brief bio-data, home address, food habits, birth date, anniversary, name of the spouse, etc. for future reference. The main idea behind this is to know our stakeholders as much as possible. Left hand side is the screen shot of the former faulty additional information page. Communication with AIT: This page stores the communication between the former faulty and the institute. This information can be used as future reference especially for the top management. Report: This page displays the list of fields available. Using this page, according to the requirement, user can select the required fields and generate customized report. Sometimes the requirement of the user is for particular information and this is the right page to do so. 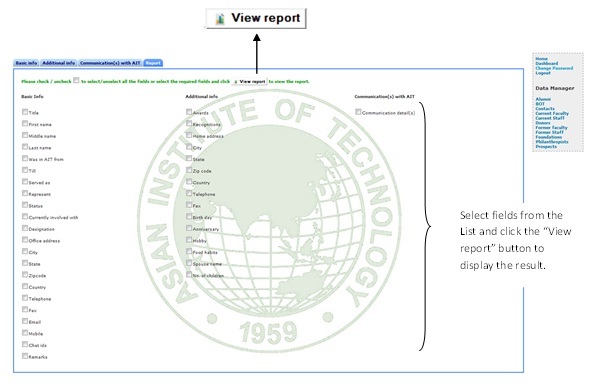 Full report at a glance: Once the user clicks the "Report" label in the first page of this module, a new window will open with all the details of the specific former faculty available in the database. Right side is the pictorial representation of the full report. Former staff members serves as our ambassadors. This module stores the updated information of our former staff members. We store information on their personal and official details, areas of interest, awards, recognitions, brief bio-data, hobby, food habits, etc. for your future reference. List of Former staff: Right hand side picture is the pictorial representation of the list of the former staff page. The user can choose to view all the information or choose an alphabet to sort by last name to minimize the list. The user can also sort by first name, school, current organization, etc. The user can also view the full report in one click by clicking the associated Report link. The user can also view/edit the information depending on their user role. Depending on the user role the user can also add new records. View/edit screens: Once the user clicks the view/edit label, the user is redirected to the page where forms are used to enter and /or update the information of a particular member depending on the role of the user. Such as the administrator will have the full access; top management may only view the detail information; data manager may only edit information, etc. The total information is divided into several tabs, such as basic information, additional information, communication with AIT and report. Left hand side picture is the screen shot of the top navigation menu for this module. Basic information page: This page stores the basic information of the former staff member, such as title, name, address, email, telephone, etc. A picture of the former staff is also uploaded for future reference. 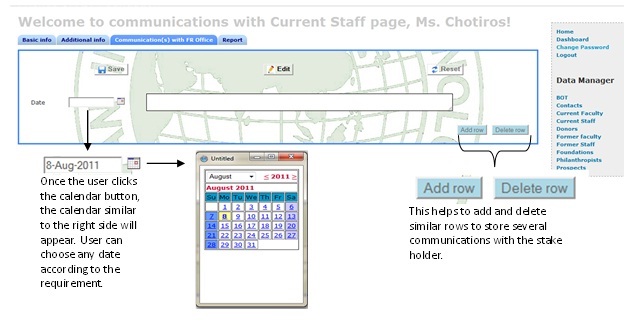 Right hand side picture is the screen shot of the former staff basic information page. Mandatory fields are marked with red (*) marks. 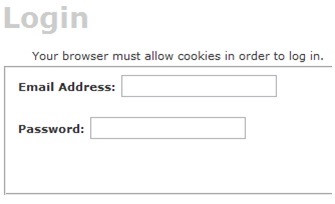 If the mandatory field is not entered, a message box is displayed with proper instruction. Depending on the user role, users are authenticated to view/edit the information. As shown on the right side, the page has 3 button namely Save, Edit and Reset. To enable the fields the authorized user needs to click the Edit button. Once there are any changes the Save button needs to be cliked to save and / or update information. The Reset button resets all the fields on the page. The authrorized user is also eligible to update the picture of the member. Once the user clicks the picture area, a popup window will appear and using the pop-up window the user can update the pictre. The picture size needs to be within 64 Kb. Additional information page: We are storing some additional information of our former staff members, such as their research interests, awards won, recognition, brief bio-data, home address, food habits, birth date, anniversary, name of the spouse, etc. for future reference. Left hand side is the screen shot of the former staff additional information page. This page has the similar 3 buttons namely Save, Edit and Reset with similar functionalities. 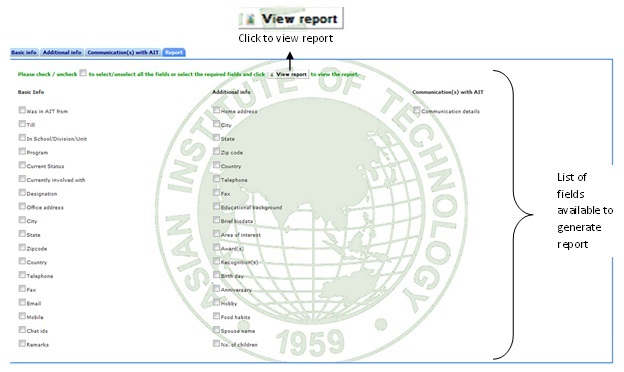 Communication with AIT: This page stores the communication between the former staff and the institute. Right hand side is the pictorial presentation of the communication with AIT page. Throgh the add and delete buttons the authotized user is eligible to add multiple meeting details. This information can be used as reference for the top management. This has the similar 3 buttons, namely Save, Edit and Reset with the same functionalities. Report: This page displays the list of fields available. Sometimes the user requires to view particular information and this page provides this option. 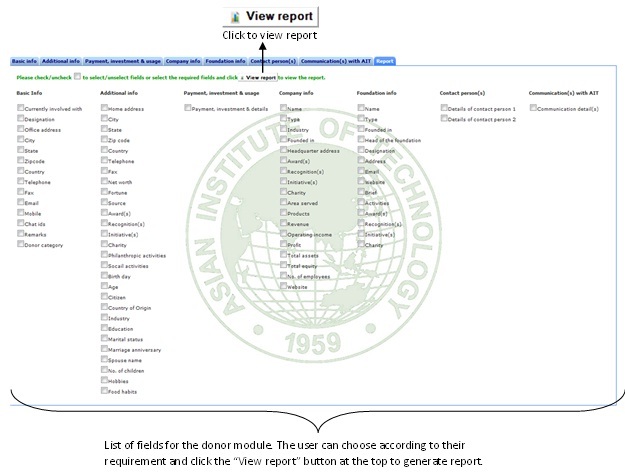 Once the user chooses the required fields, then he/she needs to click the View Report button to view the customized report in a separate page. Left hand side is the pictorial representation of the report page. Full report at a glance: Once the user clicks the "Report" label in the first page on the list of former staf page, a new window will open with all the details of the specific former staff available in the database. During the silent phase we will concentrate more on the AIT community consisting of alumni, faculty, staff, board / council members, etc. During the second phase we will concentrate more on the foundations, philanthropists, corporations, etc. In the meantime we will have the module ready to key in all the required information we plan to store. List of Foundations: Once the user enters the foundation module, they will see a list a foundation names. From this window the user will be able to view a detail report on the foundation by clicking the Report link associated with each foundation. The user can also either view the full list or narrow down the search by selecting any of the alphabets. The user can also rearrange the list by foundation type and / or founder name. 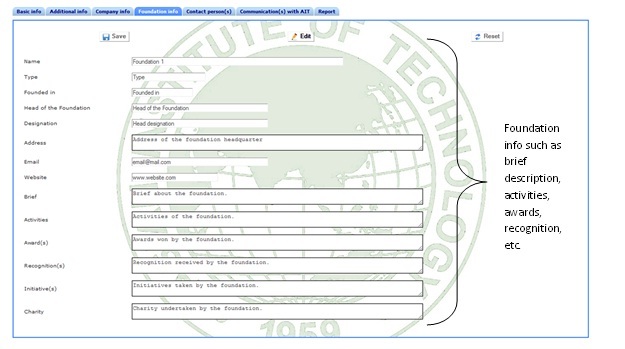 Right hand side is the screen shot of the list of foundation page. 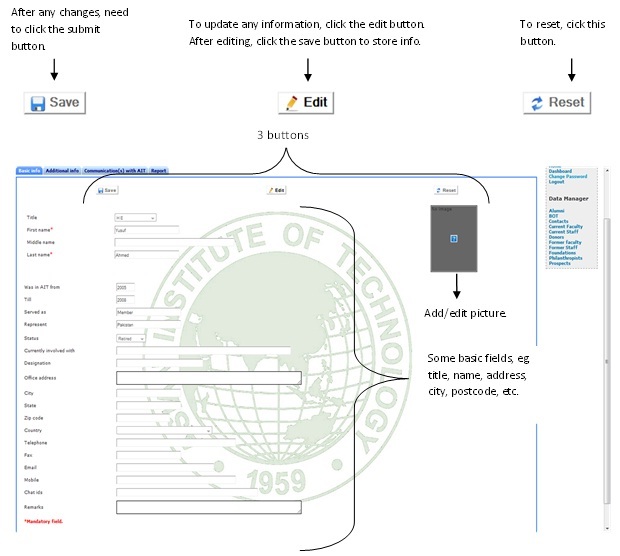 View/edit screens: Once the user clicks the view/edit label, the user is redirected to the page where forms are used to enter and /or update the information of a particular member depending on the role of the user. Such as the administrator will have the full access; top management may only view the detail information; data manager may only update information, etc. Left hand side picture is the screen shot of the top navigation menu for this module. 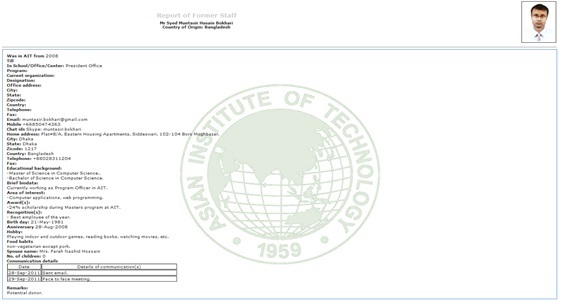 The total information is divided into several tabs, such as basic information, brief about the foundation, foundation activities, contact person, communication with AIT and the report. 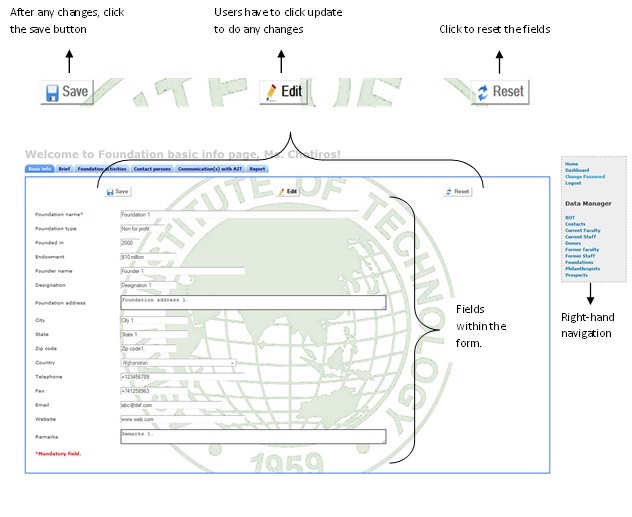 Basic information page: This page stores and displays the basic information of the foundation, such as foundation name, founder name, when the foundation was founded, endowment, detail address, email, etc. 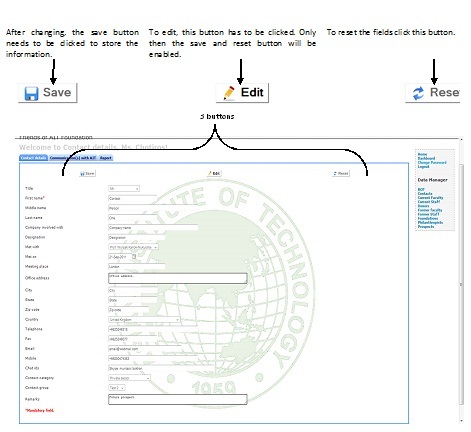 The user will be able to insert, update and reset the total form through this page depending on the user role. The mandatory fields are marked with a red color star (*). Right hand side is the screen shot of the foundation basic information page. This page has 3 buttons, namely Save, Edit and Reset. The authorized user needs to click the edit button to enable all the fields. Once there are any changes the user needs to click the save button to save the changes made. The reset button will reset all the fields to empty. Brief about the foundation: This tab stores a brief information of the foundation, such as focus area, area served, method of contribution, if the foundation has received awards, list of recognition, etc. Similar to the earlier page, it has also 3 buttons such as save, edit and reset the values within the form. We will maintain and store as much as information is available on a particular foundation, so that in the near future we may access the records and match the requirement of a foundation with the expertise available in AIT for projects and funding. The picture of the left hand side is the screen shot of the brief information page. Foundation activities page: This page stores information on foundation activities, such as research and philanthropic activities by the foundation, the list of initiatives by the foundation, list of charities by the foundation, etc. This has also similar 3 buttons; namely save, edit and reset values within the tab to update, edit and reset the values. 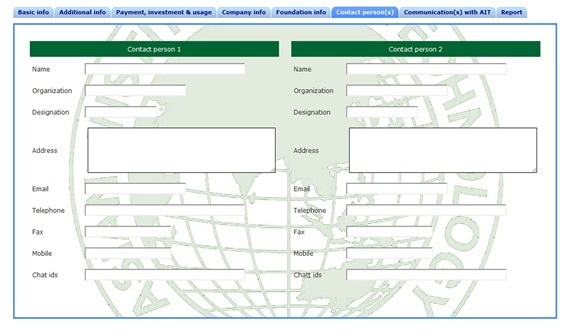 Contact person page: To communicate with the foundation we may need to go through a person who is in close ties with both the foundation and AIT. We may also need to constantly keep in touch with a concerned person within the foundation. This is why we have kept room for storing information for 2 persons. Left hand sid picture is the screen shot of the foundation contact person page. Similar to the other pages of this module, it has 3 buttons, namely Save, Edit and Reset to update, save and reset the values. 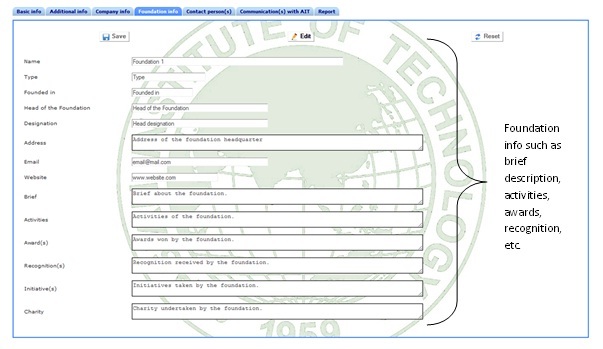 Communication with AIT: This page stores the communication between the foundation and the institute. The authorized user is eligible to add and delete rows to save several meeting information. This information can be used as fitire reference for the top management. Report: This page displays the list of fields available. Sometimes, the user requires to view specific information and this is the right page to do so. According to the requirement, user can select the required fields and generate customized reports. Detail report at a glance: Once the user clicks the "Report" label in the first page of this module, a new window will open with all the details of the specific foundation available in the database. This is very helpful for especially for the top management to quickly view the details at a glance. This module stores information on the philanthropist details. We try to store as much as information for each individual philanthropists in order to know them better. We plan to search internet, communicate with any contacts who may be a common friend of both the philanthropist and institute. 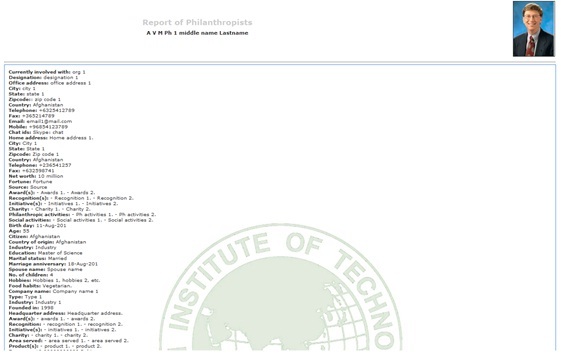 List of Philanthropists: Right hand side picture is the screen shot of the list of philanthropist page. Through this page the user can view/edit, add a new record depending on their user role. The users can also within one click view the details of each individual at a glance. Through this page the user can also sort the list alphabetically by last name to narrow down the search. The user can sort the list by first name, country, organization, etc. View/edit screens: Once the user clicks the view/edit label, the user is redirected to the page where forms are used to enter and /or update the information of a particular member depending on the role of the user. Such as the administrator will have the full access; top management may only view the detail information; data manager may have the authority to only view and update information, etc. Left hand side is the screen shot of the top navigation menu for this module. The total information is divided in to several tabs, such as basic information, additional information, company information, foundation information, contact person, communication with AIT and report. Basic information page: This is the basic information of the philanthropists, such as title, name, address, email, telephone, etc. A picture of the philanthropists is also stored for future reference. Once the user clicks the picture area, the user will see a pop-up window through which the picture can be updated. Right hand side is the screen shot of the philanthropist basic information page. This page has 3 buttons, namely Save, Edit and Reset to store, update and reset information of the specified tab of the specific philanthropist. The user needs to click the edit button to enable all the fields. Once there is any changes the save buttons needs to be clicked to save the changes. The reset button resets all the fields to empty. The mandatory fields are marked with a red star (*) mark. Additional information are provided on the page itself. Additional Information page: The additional information page includes some personal information, such as home address, awards, recognition, birth date, marriage date, anniversary, food habits, marital status, hobby, list of philanthropic activities, response to social responsibilities etc. Similar to the other pages it has 3 buttons, namely Save, Edit and Reset to insert, update, and reset any values. 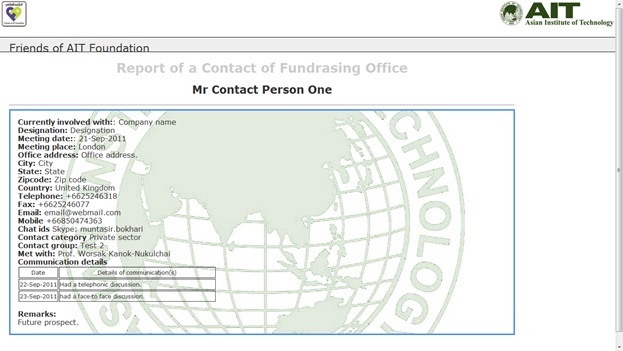 Left hand side is the screen shot of the philanthropist additional information page. Company information page: This page stores information on the company owned/managed by the philanthropist, such as company name of the company, founded in, type of business, awards, charity, recognition, revenue, operating income, profit, asset, number of employee, etc. Similar to the other pages it has 3 buttons to insert, update and reset the values. Foundation information page: This tab of the philanthropist module stores information on the foundation founded / managed by the individual, such as foundation name, founded in, head of the foundation, activities, recognitions, initiatives, etc. This tab has similar 3 buttons such as Save, Edit and Reset to update and reset the values. Contact person information page: Sometimes the philanthropist will be approached through an alumni network or friends of alumni, staff, faculty, even students. Also there is always one person with whom we may need to contact for further communication, etc. This page will store information of both the contact persons for our reference. 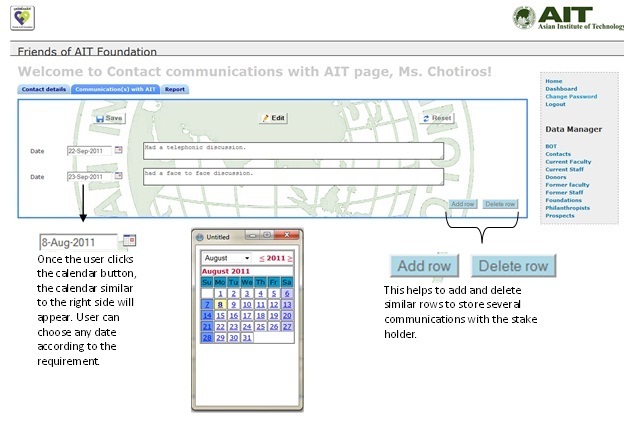 Communication with AIT: This page stores the communication between the foundation and the institute. The user can use the add and delete button to add rows to save several meeting information. This information can be used as reference for the top management. Left side picture demonstrate the page. 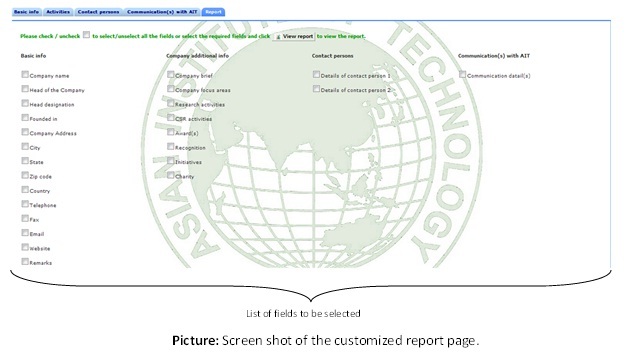 Report: This page displays the list of fields available for this module to generate a customized report. Sometimes, the user needs to access to particular information and this is the right page to do so. According to the requirement, user can select the required fields and generate customized reports. Full report at a glance: Once the user clicks the "Report" label in the first page of this module, a new window will open with all the details of the specific philanthropists available in the database. This is useful for especially for the top management to view the detail at a glance. This module stores information of the prospects of the campaign. The prospect can be either any one whose information is already stored in other modules or a may be a new member. If the prospects information is already stored in any other module, the administrator has the right to transfer all the details to the prospect module from other modules. Once the prospect becomes a donor all the information of the prospect will be transferred to the donor module and deleting information from the prospect module. So, this module is basically transferring information from one module to another. More details are explained in the rest of the section. List of Prospects: Following is the screen shot of the list of prospects page. The use can either view the whole list or sort alphabetically by last name. User can also sort by company, job tile, first name, etc. to narrow down the search. Depending on the role, the user can add a new prospect. 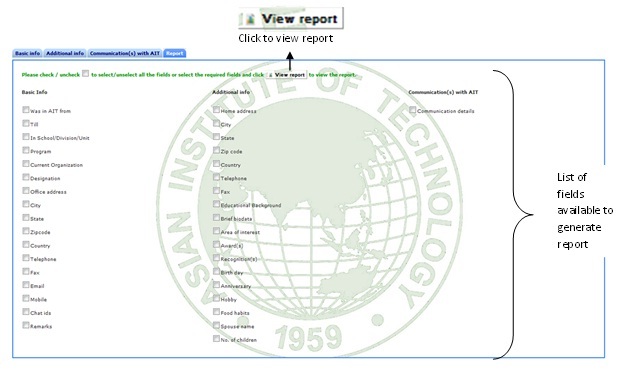 The user can also view the detail report by clicking the associated Report link. Authorized user is also eligible to edit the information using forms. right hand side picture is the screen shot of the list of prospect page. View/edit screens: Once the user clicks the view/edit label, the user is redirected to the page where forms are used to enter and /or update the information of a particular member depending on the role of the user. Such as the administrator will have the full access; top management may only view the detail information; data manager may have the authority to only view and update information, etc. Left hand side picture is the screen shot of the top navigation menu for this module. The total information is divided into several tabs, such as basic information, additional information, company information, foundation information, contact person information, communication with AIT and report. Basic information page: This is the basic information page of the prospect, such as title, name, address, email, telephone, etc. A picture of the prospect is also stored for future reference. Once the user clicks the picture area, a pop-up window appears and using the pop-up authorized users are allowed to upload pictures. The pictures needs to be within 64 Kb. Right hand side is the screen shot of the prospect basic information page. This modules has 3 buttons, namely Save, Edit and Reset to store, update and reset information of the specified tab of the specific prospect. The edit button is required to enable all the fields. Once there is any change, the user is requested to clicl the save button to save all the changes. The reset buton resets all the fields within the tab to empty. The mandatory fields are marked with a red star (*) mark. Additional information are provided in the pages itself. Additional Information page: The additional information page includes some personal information of the prospect, such as home address, awards, recognition, birth day, marriage day, anniversary, food habits, marital status, hobby, list of philanthropic activities, response to social responsibilities etc. Similar to the other pages it has 3 buttons, namely Save, Edit and Reset to insert, update, and reset any values. Left hand side picture shows the screen shot of the prospect additional information page. Company information page: This page stores information on the company owned/managed by the prospect, such as name of the company, founded in, type of business, activities, awards, recognition, initiatives, ect. Similar to the other pages it has 3 buttons to insert, update and reset the values. Left hand side picture is the screen shot of the company information page. Foundation information page: This tab of the prospect module stores information on the foundation founded / managed by the individual. This page includes foundation name, head of the foundation, activities, areas of interest, awards, recognitions, initiativies, etc. This tab has, similar to the other pages, 3 buttons to update and reset the values. Left hand side is the pictorial representation of this tab. Contact person information page: Sometimes the prospect will be approached through an alumni network or friends of alumni, staff, faculty, even students. Also there is always one person with whom we may need to contact for further communication, etc. This page will store the information of both contact persons for our reference. Right hand side picture shows the contact person page for the prospects. Communication with AIT: This page stores the communication between the prospect and the institute. This information can be used as reference for the top management. Authorized user can add and delete rows to store several meeting details. Left hand side is the screen shot of the communication page. 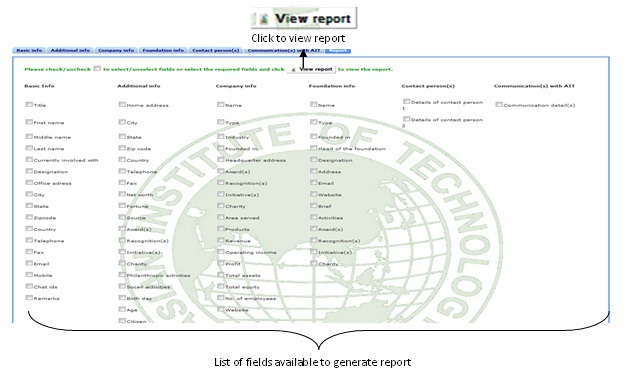 Report: This page displays the list of fields available for this module to generate a customized report. According to the requirement, user can select the required fields and generate customized reports. 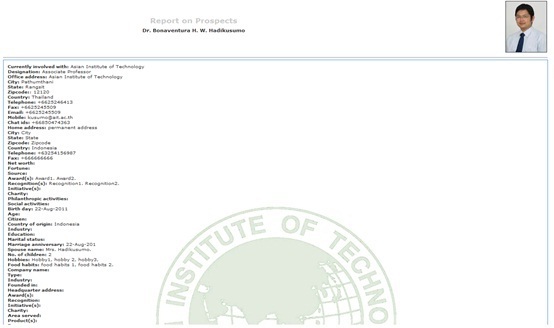 Right hand side is the pictorial representation of the report page. Full report at a glance: Once the user clicks the "Report" label in the first page of this module, a new window will open with all the details of the specific prospect available in the database. Left hand side is the pictorial representation of the detail report at a glance. This module stores information of the private companies which may be contacted or already initially communicated with by AIT personnel. The system stores very basic information on each of the private companies, which can be used in the later stages. Once the company is identified as a prospect then the information will be copied to the prospect module for further research. The details of each of the pages are shown below. List of Private companies: Right hand side is the screen shot of the list of private company page. The user can either view the whole list or sort alphabetically by company name. User can also sort by company’s head name and country. Depending on the role, the user can add new companies also. The user can also search for specific information within this module. View/edit screens: Once the user clicks the view/edit label, the user is redirected to the page where forms are used to enter and /or update the information of a particular member depending on the role of the user. Such as the administrator will have the full access; top management may only view the detail information; data manager may have the authority to only view and update information, etc. Left hand side is the screen shot of the top navigation menu for this module. Basic information page: This page stores and displays the basic information of the private company, such as company name, head of the company, when the foundation was founded, detail address, email, etc. The user will be able to insert, update and reset the total form through this page depending on the user role. The mandatory fields are marked with a red color star (*). Right hand side is the screen shot of the foundation basic information page. Comapny activities: This tab stores a brief information of the company, such as focus area, area served, if the company has received awards, list of recognition, etc. Similar to the earlier page, it has also 3 buttons such as save, edit and reset the values within the form. We will maintain and store as much as information is available on a particular company, so that in the near future we may access the records and match the requirement of a company with the expertise available in AIT for projects and / or funding. The picture of the left hand side is the screen shot of the company activities page. Contact person page: To communicate with the company we may need to go through a person who is in close ties with both the company and AIT. We may also need to constantly keep in touch with a concerned person within the company. This is why we have kept room for storing information for 2 persons. Left hand side picture is the screen shot of the company contact person page. Similar to the other pages of this module, it has 3 buttons, namely Save, Edit and Reset to update, save and reset the values. 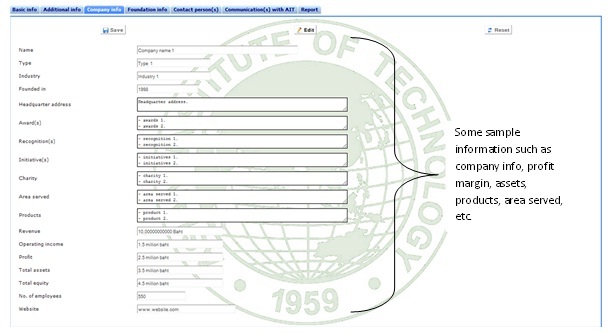 Communication with AIT: This page stores the communication between the company and the institute. The authorized user is eligible to add and delete rows to save several meeting information. This information can be used as futue reference for the top management. Detail report at a glance: Once the user clicks the "Report" label in the first page of this module, a new window will open with all the details of the specific company available in the database. This is very helpful especially for the top management to quickly view the details at a glance.